Mercedes racer from Marusan,Japan. Car and driver made of tinplate. Made in 1950es. Friction driven. Very good condition 10 1/4 inch= 26 cm. Red racer car of tin plate,Japan.. This piano is in an incredible original condition with a lot of lovely details. It is made of Pewter, hand painted in black with gold decor (original), it has the original piano candlesticks at each side and also the pedals are present.When the lid is lifted, you can see the keyboard. A wonderful piece in a great original shape. ( Comes from a Swedish collection) Size. 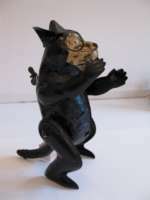 7 cm x 7 cm (2 2/ 4" x 2 3/4"
Felix the Cat, handbemaltes Blechspielzeug der Firma Gama, um 1920 hergestellt. Das schöne Blechspielzeug von der berühmten Serien-Karikatur “Felix the Cat” wurde von der Firma Gama 1920 hergestellt. Das Spielzeug hat Uhrwerkantrieb und ist handbemalt. Es ist das erste Exemplar von der Figur. Zustand und Funktion sind sehr gut. Höhe 17 cm. Literatur: Ulrich Schweizer. GAMA, Die Spielzeuge von 1882 bis 1945. The toys from 1882 untill 1945,Tin and Toys Verlag, 2010. David Longest, Character Toys and Collectible Collector Books. Crawling lithographed tin plate Clown from Günthermann,Germany . Crawling tin plate Clown from Günhtermann,Germany.Interesting lithographed circus animals on his dress.Clockwork.Functions well.Good condition. Quite rare to find. Made about 1920. L.20 cm/ 8 inch with stick. L= 15 cm/6 inch without stick. Hand painted clown made by Günthermann,Germany. Hand painted clown made by Günthermann Germany. Made about 1915. The mechanism will be activated by moving the arms. Very good condition and working fine. H= 16,5 cm/ 6,5 inch. 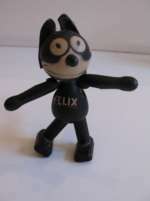 Felix the Cat. Wooden toy.Comic. Felix the Cat. Wooden toy.Pat.by Sullivan,USA 1922 and 1924.Very fine condition.H=9,5 cm - 3 3/4 inch. Günthermann handbemalter Clown auf einem Esel. Deutschland um 1910. Schönes handbemaltes Blechspielzeug der Firma Günthermann, um 1910. Uhrwerkantrieb. Sehr guter Zustand. Höhe 10 cm, Breite 10 cm.